This white vent cover is your traditional choice when it comes to finding a modern looking floor register. The plastic air diffuser is made out of an ABS high-impact resin which will prevent it from corroding or rusting. 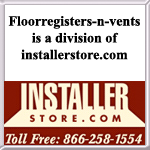 Our white vent cover can take up to 300 lbs of pressure, so there is no need to worry about using this register at home. 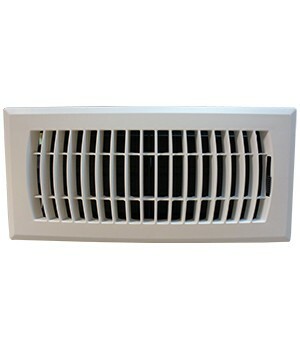 Our plastic air diffuser has sliding louvers that will open and close, allowing you to heat or cool your space easily. 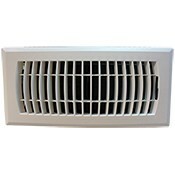 The white air vent cover will diffuse air throughout your room and will work great in places with high moisture content. These plastic air diffusers are a smart buy since they will last longer than your average metal white vent covers which will rust overtime. Tip: These plastic air diffusers are ordered according to the opening in your floor. The 4 x 12 white vent cover will drop into an opening that measures 4 x 12. If you want a decorative plastic air diffuser, we have a variety of other finishes available. Order your white vent covers today for rust proof registers that will look great in your bathroom or kitchen.